1.20" x 0.85" polypropylene thermal transfer label on a 3" x 8" core. 5000 labels per roll / 4 rolls per case. BCW Poly Pro 2351275 special features - Perforated. Use with BCW Wax/Resin Ribbon. 1.50" x 0.50" polypropylene thermal transfer label on a 3" x 8" core. 7700 labels per roll / 4 rolls per case. BCW Poly Pro 2351400 special features - Perforated. Use with BCW Wax/Resin Ribbon. 1.50" x 1.00" polypropylene thermal transfer label on a 3" x 8" core. 4300 labels per roll / 4 rolls per case. BCW Poly Pro 2351450 special features - Perforated. Use with BCW Wax/Resin Ribbon. 2.00" x 0.50" polypropylene thermal transfer label on a 3" x 8" core. 7700 labels per roll / 4 rolls per case. BCW Poly Pro 2352050 special features - Perforated. Use with BCW Wax/Resin Ribbon. 2.00" x 1.00" polypropylene thermal transfer label on a 3" x 8" core. 4300 labels per roll / 4 rolls per case. BCW Poly Pro 2352100 special features - Perforated. Use with BCW Wax/Resin Ribbon. 2.25" x 1.25" polypropylene thermal transfer label on a 3" x 8" core. 3500 labels per roll / 4 rolls per case. BCW Poly Pro 2353125 special features - Perforated. Use with BCW Wax/Resin Ribbon. 2.50" x 1.00" polypropylene thermal transfer label on a 3" x 8" core. 4300 labels per roll / 4 rolls per case. 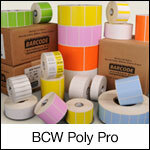 BCW Poly Pro 2354000 special features - Perforated. Use with BCW Wax/Resin Ribbon. 2.75" x 1.25" polypropylene thermal transfer label on a 3" x 8" core. 3500 labels per roll / 4 rolls per case. BCW Poly Pro 2354125 special features - Perforated. Use with BCW Wax/Resin Ribbon. 3.00" x 1.00" polypropylene thermal transfer label on a 3" x 8" core. 4300 labels per roll / 4 rolls per case. BCW Poly Pro 2355100 special features - Perforated. Use with BCW Wax/Resin Ribbon. 3.00" x 2.00" polypropylene thermal transfer label on a 3" x 8" core. 2300 labels per roll / 4 rolls per case. BCW Poly Pro 2355200 special features - Perforated. Use with BCW Wax/Resin Ribbon. 4.00" x 1.00" polypropylene thermal transfer label on a 3" x 8" core. 4300 labels per roll / 4 rolls per case. BCW Poly Pro 2357100 special features - Perforated. Use with BCW Wax/Resin Ribbon. 4.00" x 2.00" polypropylene thermal transfer label on a 3" x 8" core. 2300 labels per roll / 4 rolls per case. BCW Poly Pro 2357200 special features - Perforated. Use with BCW Wax/Resin Ribbon.